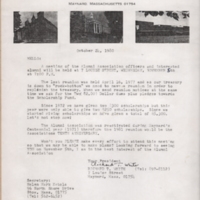 Stewart Campbell, American Legion, presenting scrapbook of Veterans Memorial to Ralph Sheridan, town historian and curator of the Maynard Historical Society. 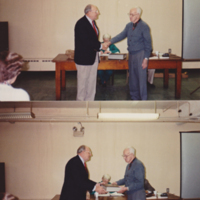 Steward Campbell on the left, Ralph Sheridan on the right. 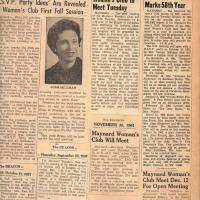 A scrapbook of photos, notices, lists, agendas etc... put together at the time of the Town of Maynard's Centennial by the women who were associated with the Maynard Country Club. 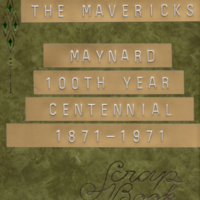 The scrapbook of the Mavericks, a chapter of the Maynard Brothers of the Brush that organized activities at the time of the towns centennial (1871-1971). 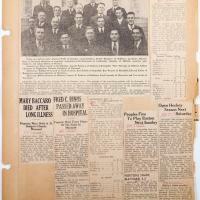 The book contains newspaper articles and photographs. 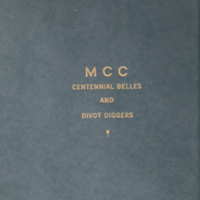 Two photo albums and a scrapbook showing the events that occurred as part of the towns 100th birthday. 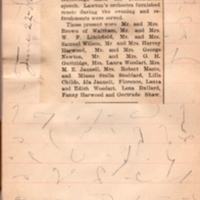 A book of newspaper clippings of marriage announcements, obituaries, anniversaries, news stories etc... superimposed on a shorthand stenography notepad. 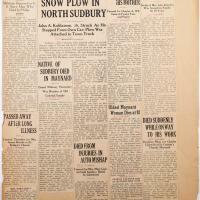 Sample page shows a news story of a tenth anniversary. 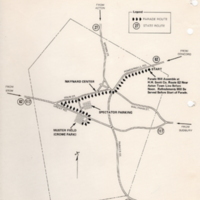 Thirty Eight pages of agendas, events, newsletters, newspaper clippings etc...during the 1970's and 1980's of the association assembled by Helen Ketola.